Abstract: The population history of Finland is subject of an ongoing debate, in particular with respect to the relationship and origins of modern Finnish and Saami people. Here we analyse genome-wide data, extracted from three teeth found in the archaeological site of Levänluhta, in southern Ostrobothnia. The site dates back to the Iron Age between 550-800 AD, according to the artefacts recovered, while radiocarbon dating on scattered femurs from the site span 350-730 AD. When analysed together with previously published ancient European samples and with modern European populations, the ancient Finnish samples lack a genetic component found in early Neolithic Farmers and all modern European populations today. Instead, we find that they are more closely related to modern Siberian and East Asian populations than modern Finnish are, a pattern also observed in genetic data from modern Saami. Our results suggest that the ancestral Saami population 1500 years ago, inhabited a larger region than today, extending as far south as Levänluhta. Such a scenario is also supported by linguistic evidence suggesting most of Finland to have been speaking Saami languages before 1000 AD. We also observe genetic differences between modern Saami and our ancient samples, which are likely to have arisen due to admixture with Finnish people during the last 1500 years. Abstract: To date, very few ancient genomic studies have been conducted in Asia. Genome-wide studies using ancient individuals from Europe have revealed complex ancestry and genetic structure in ancient populations that could not be observed studying only present-day populations, suggesting similar approaches may also aid in elucidating the demographic history in Asia. Here, we present genome-wide data for a 40,000-year-old individual from Tianyuan Cave near Beijing, China. We show that he is more related to present-day Asians than present-day and ancient Europeans. However, unlike present-day Asians, he shows potential relationships with some present-day South Americans and a 35,000-year-old European individual. Our results suggest that there was extensive population structure in Asia by 40,000 years ago that persisted over an extended period of time. Abstract: Genome-wide studies of human variation have for the most part focused either on DNA from present-day individuals, or from individuals who lived prior to 4,000 years ago. However, developing a detailed understanding of how the peoples who lived in the early Bronze Age contributed to Iron Age populations who in turn contributed to Medieval populations who in turn contributed to people living today, has been difficult. One challenge is that by the beginning of the Bronze Age (at least in Western Eurasia where the most ancient DNA data have been collected), the ancestry composition of many populations was very similar to that of populations that live in the same regions today. As a result, the powerful methods that have been developed for learning about population history based on allele frequency correlation patterns are sometimes not able to discern the often subtle differences in ancestry composition between past populations. In this talk, I will describe work in which my colleagues and I have tried to begin to bridge this divide, both by studying ancient samples from intermediate time points, and by deploying more sensitive statistical methods. Over at Current Biology at this LINK. I'm having a look now to see how this new data compare to ancient mtDNA from the Eneolithic/Bronze Age steppe. 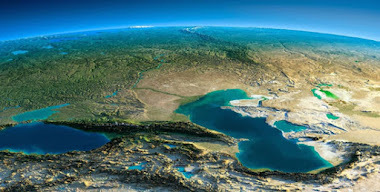 Summary: The South Caucasus, situated between the Black and Caspian Seas, geographically links Europe with the Near East and has served as a crossroad for human migrations for many millennia [1, 2, 3, 4, 5, 6, 7]. Despite a vast archaeological record showing distinct cultural turnovers, the demographic events that shaped the human populations of this region is not known [8, 9]. To shed light on the maternal genetic history of the region, we analyzed the complete mitochondrial genomes of 52 ancient skeletons from present-day Armenia and Artsakh spanning 7,800 years and combined this dataset with 206 mitochondrial genomes of modern Armenians. We also included previously published data of seven neighboring populations (n = 482). 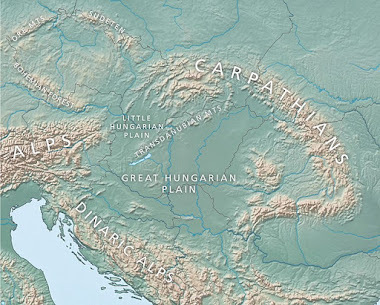 Coalescence-based analyses suggest that the population size in this region rapidly increased after the Last Glacial Maximum ca. 18 kya. We find that the lowest genetic distance in this dataset is between modern Armenians and the ancient individuals, as also reflected in both network analyses and discriminant analysis of principal components. 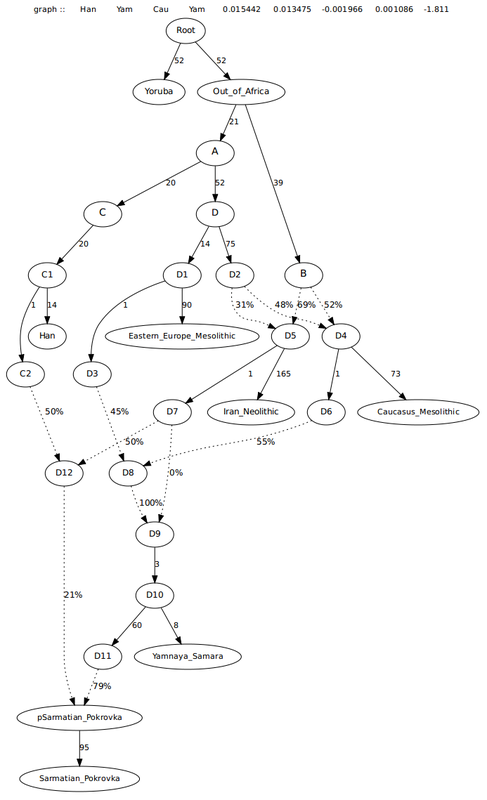 We used approximate Bayesian computation to test five different demographic scenarios explaining the formation of the modern Armenian gene pool. Despite well documented cultural shifts in the South Caucasus across this time period, our results strongly favor a genetic continuity model in the maternal gene pool. This has implications for interpreting prehistoric migration dynamics and cultural shifts in this part of the world. Update 30/06/2017: There are only 10 mitogenomes in this paper that are older than or contemporaneous with the Yamnaya culture of Eastern Europe (Neolithic to Early Bronze Age). 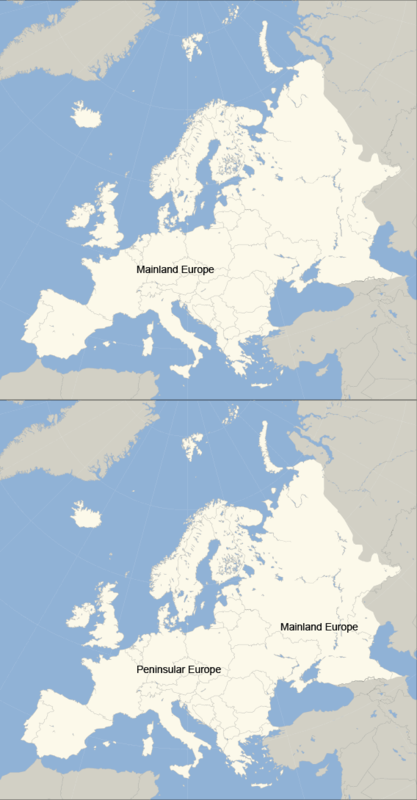 But it's pretty clear that the sampled ancient groups could not have contributed maternal ancestry to the Yamnaya people, because most of their mtDNA haplogroups and/or subclades look unusual in the context of the mtDNA diversity of Eneolithic/Bronze Age steppe groups (bolded results below). For more on the controversy surrounding the "southern" ancestry in Yamnaya, see here and here. Interestingly, what isn't mentioned in this paper is that the post-Early Bronze Age (EBA) maternal gene pool in the South Caucasus appears to have been influenced by migrations from the Pontic-Caspian steppe. 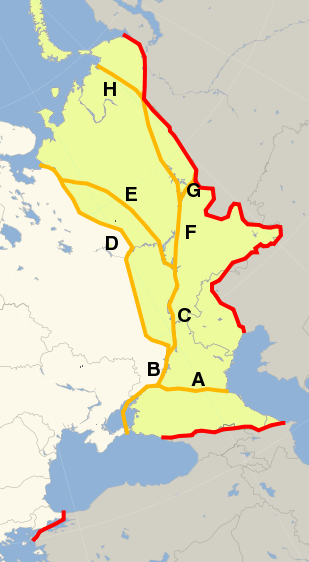 Note, for instance, the presence of haplogroups U4a, U2e1e and U5a1b in the samples dated to the Middle Bronze Age (MBA), Late Bronze Age (LBA) and Early Iron Age (EIA), respectively. These markers look more at home on the steppe than in the South Caucasus. 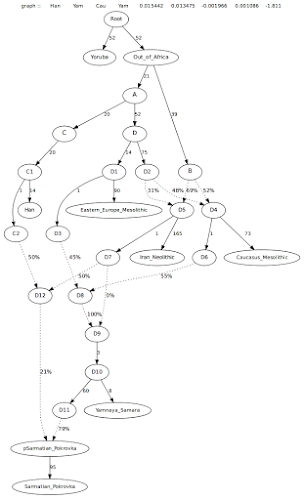 If we are to take these qpGraph models fairly literally, and I don't see why not, since they're very tight fits overall, then the early Sarmatians from what is now Pokrovka, Russia, derived almost 80% of their ancestry from Yamnaya or a very closely related group, while the rest of their ancestry came from a source that was a ~50/50 mixture between Han-like East Asians and a population closely related to Neolithic and Chalcolithic farmers from what is now Iran. 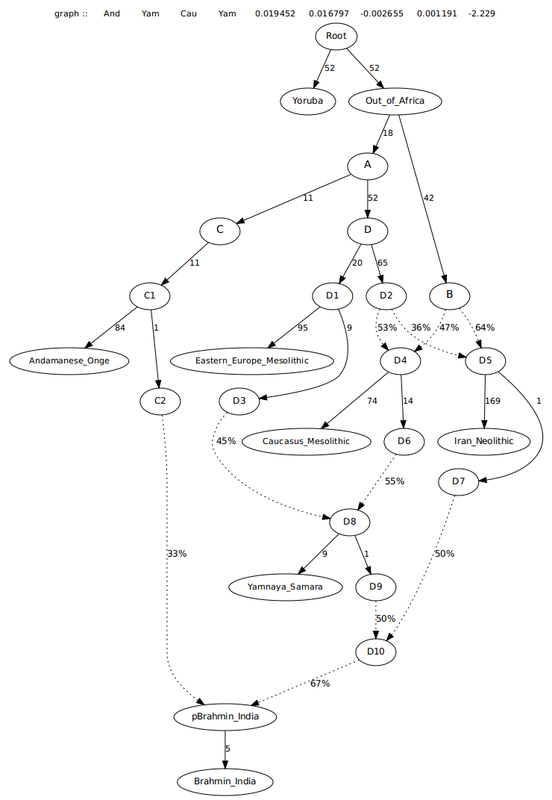 This topology also tests for the same Iran Neolithic/Chalcolithic-related input in Yamnaya, and I think it's very important to note that the relevant admixture edges (D7 to D9) are 0%, which suggests that Yamnaya did not harbor this type of ancestry. I didn't bother testing for East Asian-related admixture in Yamnaya in the same way, because it never shows such signals in other analyses. The clearly more complex ancestry of the Sarmatians is probably best explained by the fact that they belonged to a true nomadic warrior culture, and indeed one that managed to spread its influence across vast stretches of Eurasia. So these two Sarmatian individuals, both from Unterlander et al. 2017, may have had recent ancestors from as far afield as Central Asia and Siberia. On the other hand, Yamnaya was a semi-nomadic pastoralist population, and although also highly mobile and prone to long-distance expansions, probably not as mobile as the Sarmatians. Update 30/06/2017: Interestingly, adding Siberian Upper Paleolithic genome MA1 to the topology in the main model slightly shifts the admixture coefficients for Yamnaya, resulting in an arguably more accurate outcome in which it's modeled as a 50/50 mixture of populations closely related to Eastern European and Caucasus Mesolithic foragers. Abstract: Genetics can provide invaluable information on the ancestry of the current inhabitants of Cyprus. A Y-chromosome analysis was performed to (i) determine paternal ancestry among the Greek Cypriot (GCy) community in the context of the Central and Eastern Mediterranean and the Near East; and (ii) identify genetic similarities and differences between Greek Cypriots (GCy) and Turkish Cypriots (TCy). Our haplotype-based analysis has revealed that GCy and TCy patrilineages derive primarily from a single gene pool and show very close genetic affinity (low genetic differentiation) to Calabrian Italian and Lebanese patrilineages. In terms of more recent (past millennium) ancestry, as indicated by Y-haplotype sharing, GCy and TCy share much more haplotypes between them than with any surrounding population (7–8% of total haplotypes shared), while TCy also share around 3% of haplotypes with mainland Turks, and to a lesser extent with North Africans. In terms of Y-haplogroup frequencies, again GCy and TCy show very similar distributions, with the predominant haplogroups in both being J2a-M410, E-M78, and G2-P287. Overall, GCy also have a similar Y-haplogroup distribution to non-Turkic Anatolian and Southwest Caucasian populations, as well as Cretan Greeks. TCy show a slight shift towards Turkish populations, due to the presence of Eastern Eurasian (some of which of possible Ottoman origin) Y-haplogroups. Overall, the Y-chromosome analysis performed, using both Y-STR haplotype and binary Y-haplogroup data puts Cypriot in the middle of a genetic continuum stretching from the Levant to Southeast Europe and reveals that despite some differences in haplotype sharing and haplogroup structure, Greek Cypriots and Turkish Cypriots share primarily a common pre-Ottoman paternal ancestry. Y-haplogroup frequencies within GCy and TCy can be found in S6 Table. Y-haplogroup frequencies of Cypriots, Greeks, and Turks, as well as other surrounding populations can be found in Fig 1 (as well as S7 Table). GCy and TCy showed very similar frequencies for the major Y-haplogroups, differentiating both from Greek and Turkish sub-populations (Fig 3). The most frequent major Y-haplogroup subclade in both GCy and TCy was J2a-M410 (23.8% and 20.3% among GCy and TCy, respectively), followed by E-M78 (12.8% Vs 13.9%) and G2-P287 (12.5% Vs13.7%). R1b-M343 was found in higher frequency among GCy (11.9%) than TCy (6.8%), while the same applies for E-M123 (13.1% Vs 6.3%). Finally, haplogroup, although in much lower frequencies than the aforementioned haplogroups, haplogroup I2 was somewhat higher among TCy (6.8%), than among GCy (2.3%), while haplogroup J2b was higher among GCy (5.8%) than TCy (1.8%). Other, less common haplogroups (i.e. I1, R1a, L, and T) showed similar frequencies (in the range of 1–5%) between GCy and TCy. One additional difference between GCy and TCy was the presence of moderate numbers of East Eurasian (primarily Central Asian) Y-haplogroups and small numbers of North African Y-haplogroups among TCy but not among GCy. The frequency of East Eurasian haplogroups among TCy was C-M130 (0.5%), H-L901 (0.3%), N-M231 (2.4%), O-M175 (0.8%) and Q-M242 (1.3%), reaching a total of 5.6%, but only totalling 0.6% among GCy. 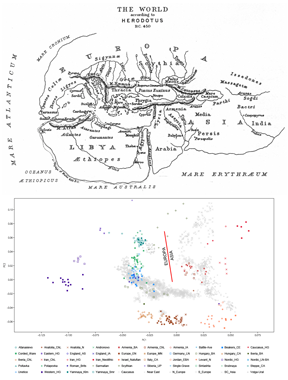 North African haplogroups (E-M81, E-V38) were only found among TCy (2.1%) (S6 and S7 Figs). A major feature differentiating Cypriots from Greeks, is the much lower frequency of haplogroups I (2.9% GCy, 7.3% TCy, ~10–21% mainland Greeks) and R1a (2.9% GCy, 3.2% TCy, ~10–22% mainland Greeks) among the former. All differences in haplogroup frequencies between populations were statistically significant (Fisher’s Exact test, p<0.001). In terms of Y-haplogroup distribution, Cypriots (GCy and TCy) show substantial differences from Greeks, characterized by much lower frequency of haplogroups I2, R1a, and R1b in the former. These haplogroup differences indicate differential migrations into Cyprus and mainland Greece, at different points in history and prehistory. I2 is considered the major haplogroup among Mesolithic European Hunter-Gatherers, who apparently were either absent from Cyprus or were totally diluted (nearly extinguished) by subsequent migrations. Although the exact origins and migratory patterns of R1a and R1b are still under rigorous investigation, it seems that they are linked to Bronze Age migrations from the Western Eurasian Steppe and Eastern Europe into Southern (including Greece) and Western Europe. Apparently, such migrations (especially as regards R1a) into Cyprus were limited. Additionally, the Greek population has received considerable migrations during the Byzantine era and the Middle Ages from other Balkanic populations, such as Slavs[62,63], Aromanians (Vlachs), and Albanians (Arvanites)[65,66]. The former, is very likely to have increased R1a frequencies among Greeks. In fact, Fig 3 (also S7 Table) indicate that R1a increases gradually with increasing latitude in Greece. There is no historical evidence for such migrations into Cyprus during the same period. 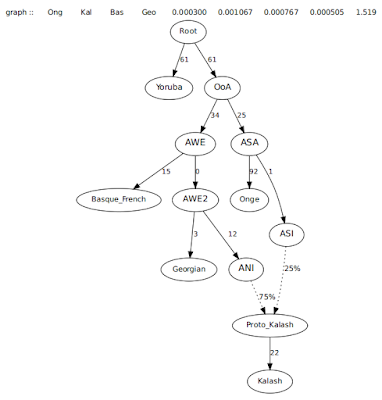 I managed to put together a simple qpGraph model for the Kalash using present-day populations. 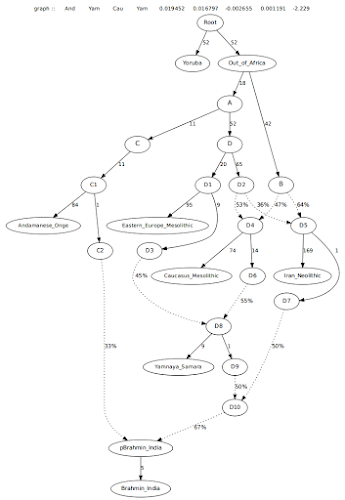 It's largely based on the model for the Paniya by Nakatsuka et al. (see Supplementary Figure 5. here). The graph and pops files for my model can be downloaded here and here, respectively. 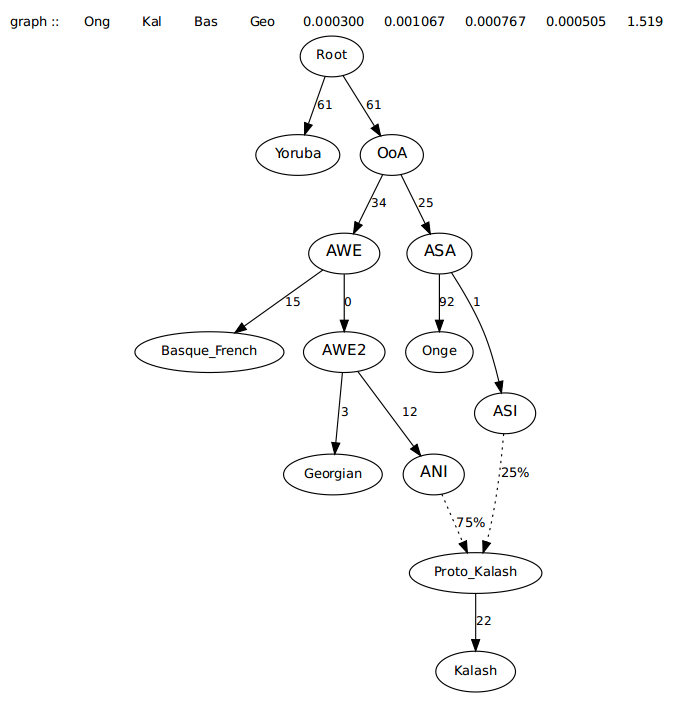 I'm now working on a more complex model for the Kalash that includes ancient genomes from Eastern Europe and West Asia. 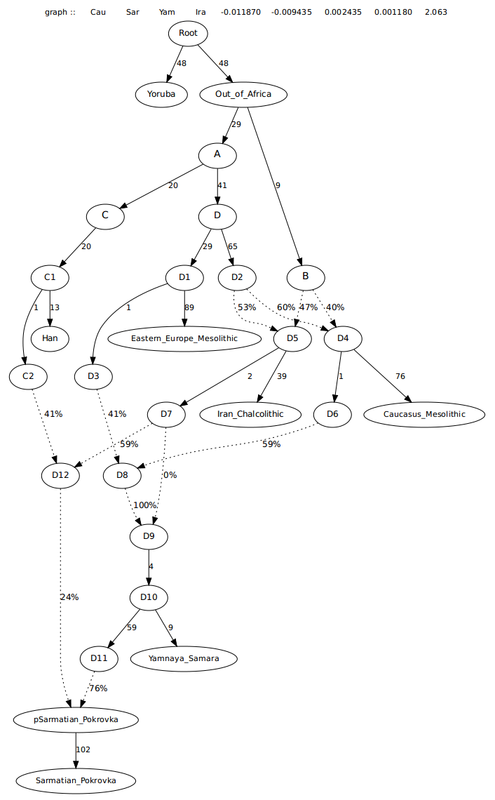 I'm willing take a few requests for qpGraph models in the comments below. Please note, however, that these requests will have to be accompanied by graph and pops files, and the graph files must be correctly set out; if they don't work, then they don't work, and you won't get your graph. On the other hand, you only need to supply pops files with the correct populations and I'll do the rest. For ancient Mesopotamia McCorriston has proposed a fundamental shift from linen-based to woollen textile production. Drawing on evidence from cuneiform texts as well as faunal and botanical remains, she suggests that it was in the 3rd or perhaps late 4th millennium BCE that wool became the fibre of choice for everyday use. Recent archaeological and archaeozoological research, however, suggests a considerably earlier date, before the advent of writing. Written sources from the mid- to late 3rd millennium BCE demonstrate that sheep and goats were maintained in herds of some dozens to a few hundred and herded in large flocks up to several thousand animals. In fact, cuneiform records provide ample evidence for the usage of wool in textile manufacture, whereas linen appears only rarely. The growth of a large-scale woollen textile industry rested on women as the main source of labour. During the Late Uruk and Jemdat Nasr periods in Mesopotamia, scenes appear on cylinder seals that have been interpreted as showing textile production carried out by so-called pigtailed figures. A specific raw material cannot be deduced from these depictions, but the substantial number of scenes indicates a significant concern with cloth manufacture. Abstract: The genomes of ancient humans, Neandertals, and Denisovans contain many alleles that influence disease risks. Using genotypes at 3180 disease-associated loci, we estimated the disease burden of 147 ancient genomes. After correcting for missing data, genetic risk scores were generated for nine disease categories and the set of all combined diseases. These genetic risk scores were used to examine the effects of different types of subsistence, geography, and sample age on the number of risk alleles in each ancient genome. On a broad scale, hereditary disease risks are similar for ancient hominins and modern-day humans, and the GRS percentiles of ancient individuals span the full range of what is observed in present day individuals. In addition, there is evidence that ancient pastoralists may have had healthier genomes than hunter-gatherers and agriculturalists. We also observed a temporal trend whereby genomes from the recent past are more likely to be healthier than genomes from the deep past. This calls into question the idea that modern lifestyles have caused genetic load to increase over time. Focusing on individual genomes, we find that the overall genomic health of the Altai Neandertal is worse than 97% of present day humans and that Otzi the Tyrolean Iceman had a genetic predisposition to gastrointestinal and cardiovascular diseases. As demonstrated by this work, ancient genomes afford us new opportunities to diagnose past human health, which has previously been limited by the quality and completeness of remains. Both the allergy/autoimmune and gastrointestinal/liver disease categories (which share many of the same disease-associated loci) show significantly lower genetic risk in pastoralists than agriculturalists and hunter gatherers. Pastoralists also have significantly reduced risk for cancer compared to agriculturalists. Agriculturalists have a higher genetic risk for dental/periodontal diseases than hunter-gatherers and pastoralists. In general, pastoralists possess extremely healthy genomes, especially for cancers and immune-related, periodontal, and gastrointestinal diseases. It is unclear why pastoralists would have the lowest risk in these specific disease categories. We caution that this pattern may be the result of technical issues, as pastoralists have the smallest sample size (only 19 individuals) and geographic range (between 40-90°E longitude and 45-55°N latitude, Figure 1B). Because populations that have different subsistence types also differ in other ways, the lower GRS of pastoral populations may be due to other factors, including demographic history.